After Trump Targets Murkowski, Interior Secretary Reportedly Warns Alaska's Senators : The Two-Way Secretary of the Interior Ryan Zinke reportedly called Sen. Lisa Murkowski and fellow Alaskan Sen. Dan Sullivan to say their state could run into trouble with the Trump administration. Sen. Lisa Murkowski of Alaska, in the Capitol on Wednesday, was one of two Republicans to vote against opening debate on the health care bill on Tuesday. Hours after President Trump criticized Republican Sen. Lisa Murkowski's vote on debating health care legislation, Secretary of the Interior Ryan Zinke reportedly called Murkowski and fellow Alaskan Sen. Dan Sullivan to say their state could run into trouble with the Trump administration. Describing the call from Zinke, Sullivan told the Alaska Dispatch News, "I'm not going to go into the details, but I fear that the strong economic growth, pro-energy, pro-mining, pro-jobs and personnel from Alaska who are part of those policies are going to stop." Zinke's message, writes the Dispatch News' Erica Martinson, was that Murkowski's vote "had put Alaska's future with the administration in jeopardy." Murkowski's office confirmed that Zinke had called her and issued a statement in which the senator notes that while she hasn't agreed with the Senate's approach, she agrees with Trump that the health care industry needs reform. "I continue working to find the best path for what I believe will achieve that," Murkowski said, "a committee process where we can work issues in the open and ensure Alaskans have the health care choices they want, the affordability they need, and the quality of care they deserve." The phone calls came one day after Murkowski and Sen. Susan Collins, R-Maine, voted against debating a replacement for the Affordable Care Act on Tuesday. The next morning, the president singled out Murkowski, saying in a tweet that she had "really let the Republicans, and our country, down yesterday. Too bad!" Sullivan says he tried to push back during the call with Zinke on Wednesday afternoon, "But the message was pretty clear." Messages to Sullivan's and Murkowski's offices were not returned as of early Thursday afternoon. A number of Alaskan officials' plans and projects would benefit from support in the executive branch, the Dispatch News says, listing road projects, drilling rights and other issues. But reliance often works both ways. In the Senate, Murkowski chairs both the Committee on Energy and Natural Resources and the Appropriations Committee's subcommittee on the interior — which means, as Roll Call reporter Niels Lesniewski notes, that Murkowski "is the top authorizer and the top appropriator for the Department of the Interior." Lisa Murkowski is the top authorizer AND the top appropriator for the Department of the Interior. Murkowski doesn't face re-election until 2022. As member station Alaska Public Media reports, Murkowski responded to Trump's tweets by saying that she's focusing on her work in the Senate, not her next election. 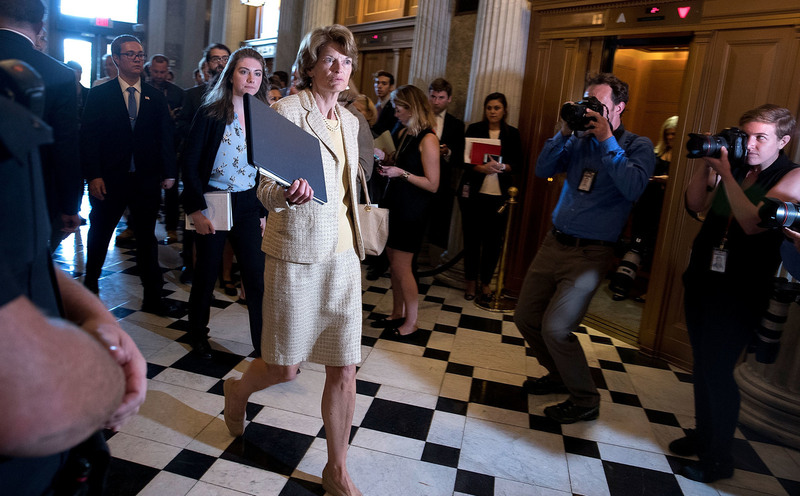 "I don't think it's wise to be operating on a daily basis thinking about what a statement or a response that causes you to be fearful of your electoral prospects," Murkowski said on MSNBC. "We're here to govern."